WGN-TV Weather WebBlog is a great resource to understand what's happened and what's coming next. Transcription of the Chicago 1902 Folio. Read the earliest published geology of Chicago, by William Alden which I typed in from photographs of this long out-of-print oversized volume and map folio. Building by building along North Michigan Avenue, Chicago. Print out a copy for a self-guided field trip or use it with a group of students. Lake Michigan Montrose Beach shows how our local lakeshore can be used for sedimentology classes. Self-guided trip to Lake Michigan shows us the lake from the viewpoint of 100-level Earth Science students. Chicago River has a little-known waterfall on the northwest side. Visit it with students at low water. Paul Sereno's Dinosaur Lab and Dinosaur Giants at Navy Pier was a fantastic opportunity for TCC students. Thornton Quarry is so large you can see it from outer space. Visit it virtually on this site prepared from many trips to the quarry. LaSalle County, Illinois has so much great geology that it is impossible to see it all in one day. Kankakee River and State Park visit a limestone canyon, a waterfall, a stack, several caves and the only crawl-through arch in this little known geological gem of the Illinois State Park system. 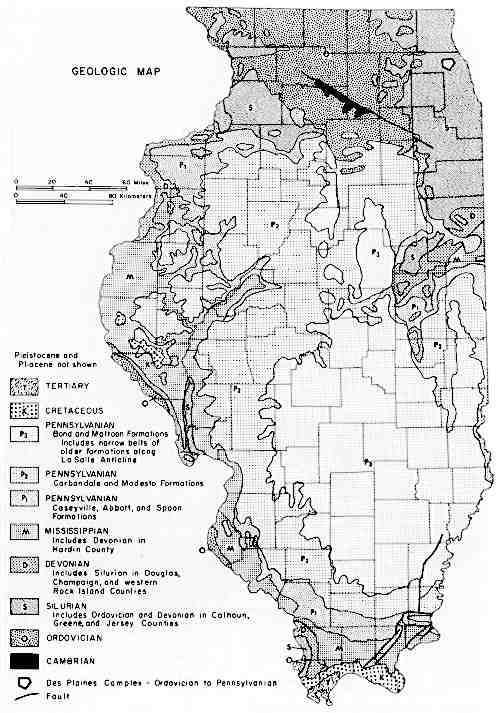 A helpful Publication List on Illinois Geology. Chicago Weather from Weather Underground. Scroll down their left frame to go to different topics. Don't miss the U.S. live-time satellite images. If it is black, it is night. Try to catch a view of sunrise or sunset. The black shadow is the terminator line; the line of day and night which sweeps around the world as we rotate beneath our sun. Chicago corridor online expressway situation map. Fabulous satellite images and a description of what can be determined from way up there using remote sensing from NASA. Chicago Convention and Tourism Bureau. Good links to places around Chicago. Peoples Energy (Peoples Gas). Information about gas and specifics about Chicago gas service. Email for customer service. ComEd's Website can be accessed by clicking the link on this page. Remember to back up all your files, power blackouts can do weird things to computers. U.S. Environmental Protection Agency Chicago region home page. Heavy on graphics and slow to load, but contains much information about the area. Chicago Department of Water. Take a plant tour, visit water trivia and brush up on ways to save water at this interesting City of Chicago website. What happens to water as it goes down the drain in Chicago. Metropolitan Water Reclamation District. Ever wonder what happens to your water after it goes down the drain? Tours and information about Deep Tunnel and water treatment. Virtual Tour of Deep Tunnel (a/k/a "TARP"). Map of Thornton TARP reservoir. PBS American Experience - Chicago! Watch a video re-creation of the Great Fire, play interactive games, learn about labor riots, immigrant neighborhoods, and find additional sources and read the who's who that created the broadcast. Chicago Public Library includes a Chicago timeline and description of historical events. Chicago Historical Society includes an online gallery about the 1871 Chicago Fire and other great resources. Chicago History Links maintained by Pat Sabin. Evanston Historical Society and Dawes House. History of Illinois Quarries maintained by Peggy Perazzo. The Adler Planetarium. Interactive tours of the Solar System and the Milky Way Galaxy online. Web camera on downtown Chicago that you can click on and select which part of the scene you wish to see. Watch the tourists run between the snowflakes on Solidarity Drive or take the long view of Chicago's downtown. The Art Institute of Chicago. Thorne Rooms, Impressionists, and much more from Chicago's premier art museum. The Field Museum hosts Sue, the world's most expensive Tyrannosaurus rex, more dinosaurs, mummies, scrolls, bugs, jades and gems - something for everyone. The Museum of Science and Industry. Visit the submarine and the coal mine, the Colleen Moore dollhouse and more. Chicago Academy of Sciences - Peggy Notebaert Museum. Lizzadro Museum of Lapidary Art in Elmhurst. The Chicago Botanic Society. Maintains 385 acres of manicured gardens along flooded portions of the Skokie River, one of the tributaries of the Chicago River. The Sears Tower. How to visit Chicago's tallest building and its skydeck. Spirit Cruises serve lunch and dinner on the lake; includes narration on buildings and Chicago history. Chicago Architecture Foundation River Cruise. Knowledgeable guides and the double deck boat Chicago's First Lady team up for 90-minute river cruises focusing on Chicago architecture. Navy Pier. Home of the Crystal Gardens, Shakespeare Repertory Theater, the Ferris Wheel and the IMAX. Regular fireworks displays in summer described by nearby residents as "like being in a war zone Wednesday and Saturday nights." Chicagoland Canoe Base has maps, information and canoes for rent all over the Chicago Region. Chicago Trolley. How to ride those cute tourist buses all day for a single ticket and other alternative transportation secrets. METRA the way to really fly. If any of their end points work for you. A warning to Eurotourists! METRA stations tend to be featureless, windswept and away from the downtowns of the towns whose names they bear. Signage at the stations is relatively uninformative, so go to their website before you try to go anywhere on their trains. Downtown train stations do not directly connect with CTA rapid transit, even if they have the same names (e.g. Clybourn METRA is nowhere near North/Clybourn CTA). Chicago Transit Authority. Maps, information, pass prices, discounts and hints for those new to the CTA. It's a somewhat slow load on older machines; the maps are hard to print out and some of the clickable buttons are not obvious. CTA fan club. Details and reviews of CTA history and service. In some ways, this site is more interesting than the official site and it certainly is easier to navigate. Friends of the Chicago River. A charming site with descriptions of historical events and places to visit the Chicago River today. Regular internship opportunities available through FOCR. Chicago River Paddling and Fishing Guide by John W. Nelson. A river fan's page about our local stream. Amphibian Monitoring Information by Ellin Beltz and Ken Mierzwa. The Monitoring program is sponsored by Chicago Wilderness and supports the nearly 200 frog monitoring volunteers who worked on our Frog Surveys, 2000 to present. Chicago Wilderness Frog Survey. A guide to Chicagoland frogs and how to volunteer to become a frog surveyor. The Chicago Herpetological Society. Photographs of local amphibians and reptiles. Links to news articles about reptiles and amphibians. Chicago Wilderness links conservation organizations, land managers, museums, universities and citizens working together to provide region wide planning for conservation and encouraging landscape restoration where possible. Chicago Academy of Sciences runs the Peggy Notabaert Nature Museum at Fullerton and Stockton in Lincoln Park and is heir to the tradition of the first Chicago Academy, founded by Simpson and Kennicott before the Great Chicago Fire. Chicago Project Squirrel studies the familiar and learns how little we know of them.